Many countries in Africa have suffered because of the gerontocratic nature of their politics, an issue I have often lamented. Some "elders", such as Robert Mugabe, lost touch with modern statecraft and the changing conditions of life - and have been toppled. Others, such as Nigeria's Muhammadu Buhari, are loathe to let go of power, and not only grow old but sick, too. Others still, like Gabon's longstanding Bongo dynasty, are determined to be fixtures who move political allies and allegiances like pawns on a chessboard, but no longer do anything to benefit countries they no longer understand. 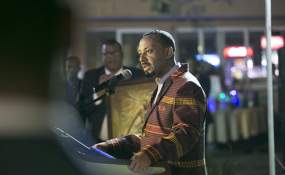 It is no wonder, then, that almost everybody's African prime minister of 2018 was Ethiopia's Abiy Ahmed. The 42-year-old survived an assassination attempt and faced down a mutiny by his own soldiers by challenging them to a push-ups competition - which he ably won. He appointed a female president and half of his cabinet ministers are women. He freed thousands of political prisoners and lifted a huge raft of censorship measures. Ahmed has also made peace with Eritrea - by the "simple" but hugely dangerous gesture of surrendering disputed territory to his neighbour. The two countries had fought a war over this territory since the 1990s, with huge casualties on both sides. But the gesture was dangerous as both countries' governments originated from liberation movements that had retained coercion and violence as necessary measures of that state. Surrendering this position runs the risk of alienating a huge section of Ahmed's own security apparatus. But while Ahmed has successfully unravelled the Gordian knot of Ethiopia's conflict with Eritrea, he cannot so easily fix the long-suppressed and growing communal and ethnic tensions within his own country. Ahmed is of ethnic Oromo descent, and his rise to the top job broke the long Tigray stranglehold on power - no easy thing, as the liberation forces that overthrew the Stalinist Derg regime in 1991 were largely from the Tigray region. But there are more ethnic divisions in Ethiopia than just these two, and many feel that they have had their voices suppressed for too long. Increasingly, they are now speaking out. I taught in that scheme and Meles Zenawi, who was prime minister of Ethiopia from 1995 to 2012, was one of my students - albeit under an assumed name, as he did not want special privileges. For a while, that spirit of self-abnegation and modesty, almost of humility, permeated Ethiopia. But the war with Eritrea which broke out so soon after liberation brought very much to the surface a securitised, secretive and suppressive approach to government. Ahmed breaks out of all of that. He is very well educated and holds a PhD as well as other degrees - including a postgraduate certificate in cryptography. Consequently, he knows a thing or two about electronic processes and modern technology, unlike the Robert Mugabes of the continent who show little interest in even turning on a computer. But can a technocratic and liberal approach to government redress the problems Ethiopia faces? The country is almost a victim of its own successes. Some urban sectors are modernising so fast that peri-urban and rural life is being marginalised and lands seized. Even Ahmed's own Oromo people have protested about this urban expansion. But - even if only for one dazzling year - Africa has a new model prime minister. Mugabe in Zimbabwe and Zuma in South Africa have gone. The sickly Buhari and the Bongo dynasty hold on. Ahmed will need to last a bit longer if he is to really become a lasting beacon of hope for a new generation. And his new female partners in government will need to help him.